Jimmy Carter can dine with Indonesia’s dictator Suharto and sign weapons deals with him even has his troops carry out acts of genocide in East Timor. Reagan/Bush41, then Bush43, can flip-flop between considering the same bunch of vile miscreants as valiant, freedom-fighting mujahedeen, then as dastardly terrorist al Qaeda operatives, and first arming and equipping them, then battling them inconclusively for 17-odd years. 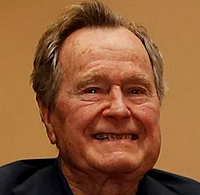 For the festering orbs, the battle for all that is good and against all that is evil is made easy by the fact that the two are interchangeable on a whim: one moment Noriega is a CIA asset, his efforts in running Panama and in enhancing CIA’s cocaine trade much valued by the CIA director George Bush, and the next moment he is a criminal to be apprehended by staging a military invasion and imprisoned for life.